Note: Recently we remembered McCook Attorney, Wade Stevens and the part he played in one of SW Nebraska’s most sensational murder cases. But before that Wade Stevens was a flyer in France during World War I. As a direct result of that experience, Wade and his friend Dr. Frank Brewster made a bit of aviation history of their own right here in SW Nebraska. During World War I there were a number of young men from SW Nebraska who volunteered to fight the Central Powers (Germany) in France. A number of these young men chose to join the Army Signal Corps, the branch of service that included the Flying Service. The aeroplane was still a very new invention — only 12 years past the Wright Brothers first flight when the war began in 1914, yet this new technology had a profound effect on the youth of America (and the world), and young men wanted to fly. One of these young men was Wade Stevens, of Beaver City (later of McCook), who was destined to become a pioneer in the field of aviation, as the pilot for the world’s first doctor to make house calls to his patients, using the airplane. graduated from high school, and later practiced law with his father, John Stevens, Jr.	Wade, a rather small man, very disciplined, and always physically fit, was a member of the Beaver City high school football team of 1913. Their record that year against area teams, including McCook, was five wins and no losses. They outscored their opponents 187-7, and were declared Champs of SW Nebraska. Wade Stevens was a modest man, but he nevertheless took great pride in the fact that he had played on the only Beaver City team that ever beat McCook. The 1913 McCook game was especially memorable for Wade. On the last play of that game, he ran 70 yards around left end for a touchdown — “The only time I was ever a football hero”. After high school Wade took a $50/ mo. job teaching a country school in Gosper Co, 25 miles from home. He rode a bicycle home on weekends. Later, teaching at a school south of Holbrook, at $60/mo. he was able to buy a one cylinder, belt drive Harley Davidson¸ enabling him “to get back and forth under more satisfactory conditions”. In early 1918 Wade was shipped overseas, where he was sure that he would be allowed to fulfill his ambition of becoming an Ace Fighter Pilot. However, it was not to be. In France his repeated requests to fly combat missions were denied and all during his overseas service he continued as a flight instructor, teaching other young men the fine points of flying combat aircraft — mostly the French built Nieuports. This was a good plane, highly maneuverable, designed from a successful pre-war race plane. It was the plane that American Ace, Eddie Rickenbacker used in some of his early victories, but it had a built-in weakness and required careful piloting to avoid the risk of wing failures. After the Armistice was signed Wade passed up going to Germany with the Army of Occupation. He was anxious to return to the U.S., where his friend, Dr. Brewster of Beaver City had arranged for him to purchase (for the doctor) an $8,000 JN-4 (Jenny) aeroplane from the Curtiss Aeroplane and Motor Co. in New York. This plane was very popular from 1917 until the late ‘20s, and widely used in barnstorming throughout the ‘30s. Dr. Brewster had selected a landing site east of Beaver City, and had built a hanger. The plane arrived in Beaver City on a railroad flatcar, in two large crates, and was hauled to the landing field on a horse drawn dray. With the help of a local mechanic, who had never seen a plane, Wade dismantled the boxes and assembled the plane. Dr. Brewster was eager to make the first flight in the plane, but Wade refused. If mistakes had been made they were his — so no passengers on the test flight. The solo flight was entirely successful, and “after cruising around to get some altitude I did a few spirals and wingovers and then went from a stall into a spin,…came out and circled for a landing.” On the next flight Dr. Brewster was Wade’s first passenger. On May 23, 1919 Wade and Dr. Brewster made a professional flight to Herndon, Kansas to attend a man, Guy Sidey, who had suffered a fractured skull in an oil well accident. No local doctor would attempt to operate on the man, so Dr. Brewster was called, and he arranged for Wade to fly him to Herndon. Mr. Sidey’s farmhouse was marked by a sheet hanging from the windmill. Wade and Dr. Brewster landed in a pasture near the house. The trip by auto would have been 70 miles and three hours over bumpy roads. The trip by air was made in 50 minutes, and Dr. Brewster, “cool and collected” removed several pieces of bone from the skull of the injured man, inserted a silver plate in the man’s head — and was home in time for supper. Sidey made a complete recovery. The short lapse of time, made possible by the plane, was credited with saving the man’s life. The next day Wade flew Dr. Brewster to McCook for another operation. 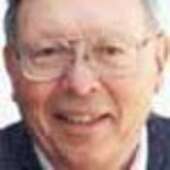 While the doctor was in surgery Wade took a few McCook citizens for their first plane ride, including Harry Strunk of the McCook Gazette (an aviation pioneer in his own right). Not long after the Herndon trip Dr. Brewster received a telegram from the Curtiss Aviation Co. stating that his was the first aeroplane in the world purchased and used for professional purposes! Dr. Brewster and Wade hardly realized that they were making flying history in the little town of Beaver City. But these flights occurred eight years before Lindbergh made his historic trans-Atlantic flight, and barely 16 years after the Wright Bros. made their first flight — years when much aviation history was being made. After a summer of serving as Dr. Brewster’s pilot, Wade Stevens enrolled in the NU law school. Following graduation Wade joined his father in the practice of law in Beaver City. Twice he was elected to the office of Furnas County Attorney. Though Wade’s days of active flying essentially ceased when he left Dr. Brewster and entered law school, his interest in flying never stopped. 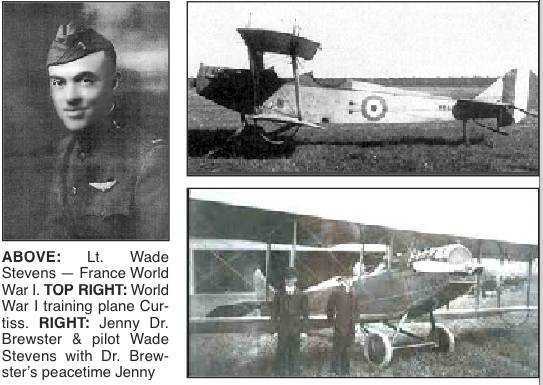 In 1972, when a crew from a magazine in New Jersey came to interview him concerning his early flying days, he was thrilled to take the controls (briefly) of the crew’s Cessna Citation Jet, and he contrasted that experience with the little Nieuport plane he had flown in France in World War I.
Wade’s old friend, Dr. Brewster stayed interested in aviation all his life. At age 83, Dr. Brewster purchased a new airplane and invited Wade and his wife, Flora to take a ride over the Harlan County Lake. Dr. Brewster was elated to take his first pilot for an airplane ride — and Wade was pleased to take the flight with his old mentor. Flora was less pleased about the plane ride. Privately, she whispered to Wade, “Can you land this thing if something happens?” Only when she was assured that Wade could indeed land the plane did she agree to go up. On their safe return she admitted that Dr. Brewster was indeed a competent pilot, even at age 83.